Mrs. Jane Pargeter of Coleman, Alberta, beloved spouse of Lester Anderson, passed away at Foothills Hospital on Sunday, October 28, 2018, at the age of 62 years. Jane was born June 6, 1956, in Solwezi, Zambia. She came to Canada with her four children and her then husband, Tony Pargeter, in 1979, settling in Calgary in 1980. 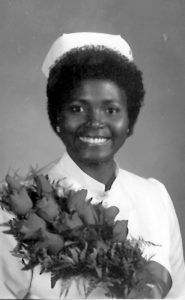 She attended Mount Royal College, qualified as a Registered Nurse at the Royal Alexandra Hospital, then went on to earn her Bachelor of Nursing at the University of Lethbridge. Jane had a long career in various fields of nursing, including intensive Care and Psychiatry, at the former St. Michael’s and Regional Hospitals in Lethbridge, and most recently Pincher Creek and Crowsnest Pass Health Centre’s. Her compassion, caring nature and attention to detail drove her commitment as a nurse. She will be sorely missed by patients and colleagues she touched throughout her career. Jane enjoyed travelling, the outdoors, cooking and many adventurous hikes with Les. She loved life, laughter and friendship. She was a spiritual person, always evolving and always in search of deeper meaning and purpose. By far Jane’s greatest passion was for her family, children and grandchildren for whom her love knew no bounds. Besides Lester and Tony, Jane is survived by her children Sunny Pargeter and David (Vanessa) Pargeter of Calgary, Steve (Heidi) Pargeter, Wendy Pargeter of Lethbridge, and her cherished grandchildren Angel Pargeter, Faith Degraff, Ashton Pargeter, Cassandra Pargeter and Darren Pargeter, as well as extended family in Zambia. Jane is predeceased by her parents Lazalo and Tumishi Chilongo; sister Diness; and granddaughter Isabelle Pargeter. A Celebration of Jane’s Life will be held at 11:00AM, Thursday, November 8, 2018, at MARTIN BROTHERS RIVERVIEW CHAPEL, 610 – 4 STREET SOUTH, Lethbridge, Alberta, with Reverend Eva Stanley officiating.